Ang Tambuli- is the official Newsletter of ACFIL, started last 2002 up to the present to form and inform the Filipinos in the region regarding the political, social & migration issues especially to those who have the difficulty in comprehending the Italian language. This was financed by the Provincia di Torino for two years and the last 6 years, ACFIL continued the action independently due to the strong demand of the community taking out also the logo of the Provincia di Torino. 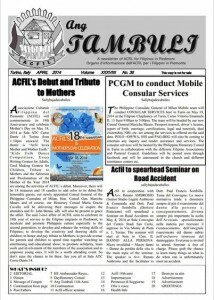 Get a copy of the April 2013 issue of Ang Tambuli from this link ACFIL’s-Ang-Tambuli-April-2014-Newsletter. 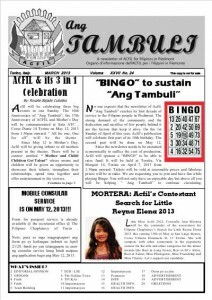 Get a copy of the April 2013 issue of Ang Tambuli from this link ACFIL’s-Ang-Tambuli-April-2013-Newsletter. 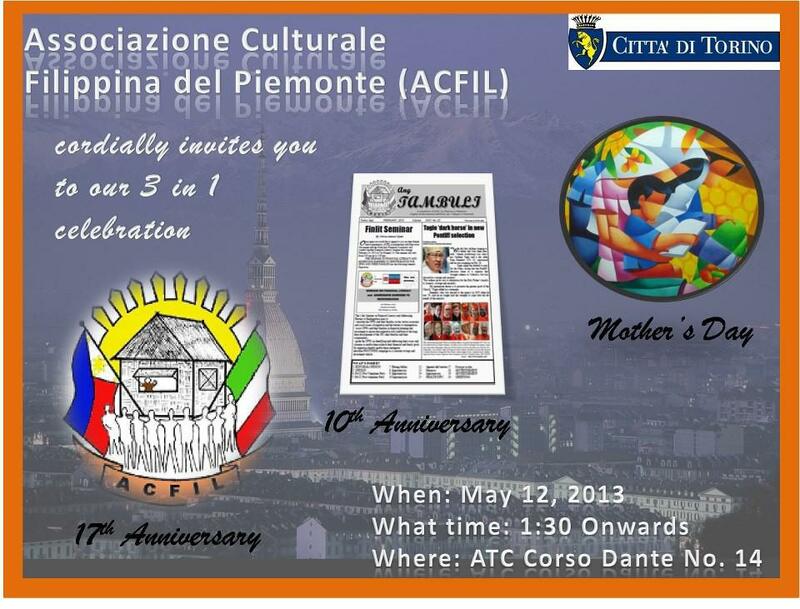 On May 12, 2013, Associazione Culturale Filippina del Piemonte (ACFIL) will hold its 3n1 celebration at Sala ATC Corso Dante 14 from 1:30pm onward. It will be a day to commemorate its 17th foundation day and the 10th anniversary of its newsletter ―Ang Tambuli. In preparation for the Festa della Republica Multietnica on June 2, various activities were organized not only to sustain the expenses of the celebration but most importantly to know each one‘s culture. 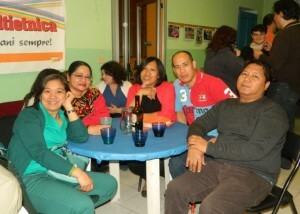 One of the events was the ―Cena Multietnica‖ held on April 13 at casa umanista, via Martini 4/b Torino at 9:00pm. It is said ― La cultura nel piatto. Iniziamo a conoscere le culture a partire dai piatti tipici. 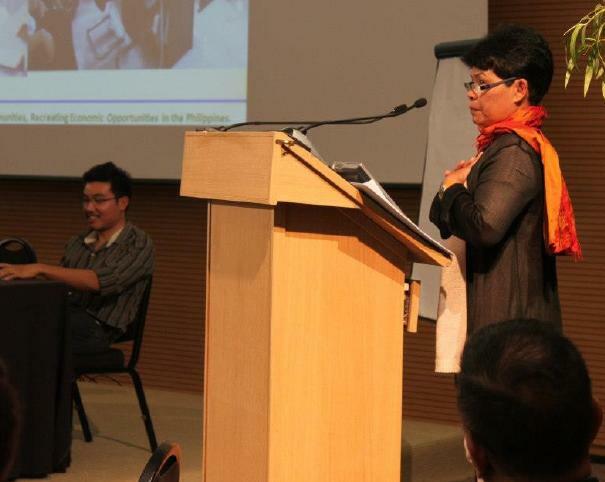 Last March 17, 2013 Acfil‘s representatives made their way to Teatro Sales, Via Copernico 9 – Milan to participate the D2D Conference . ―Connect, Listen and Act was the theme of the conference. There were 144 participants including the 6 speakers, 4 were government officials and 8 coming from Business Sectors. 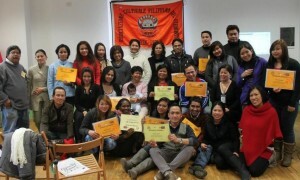 A Father in the Filipino context and culture has a very significant role in the family. An old saying which I believe can provide us a clear image of a father says ―Ang ama ay haligi ng tahanan . It means that the father is the ―pillar of a home. What is a pillar? .. it is any upright, supporting part, that makes a building stand. Considering the father as a pillar would mean that he is the prominent supporter of a home. We consider him as someone who keeps our home standing strong and firm against the attack of any intruder. 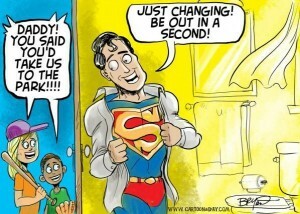 We also consider him as the provider of a home, the breadwinner. 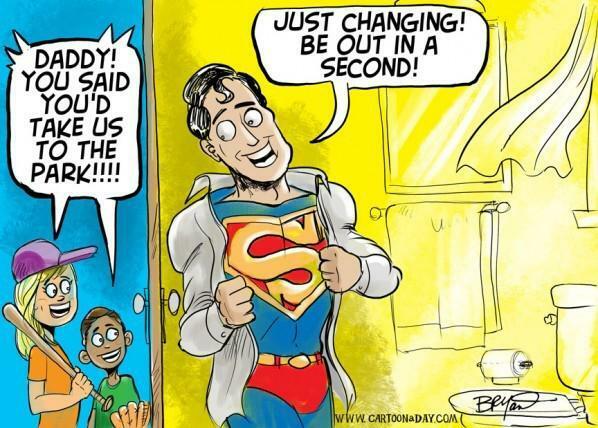 Our very own culture has a very high regard to fathers of every family. 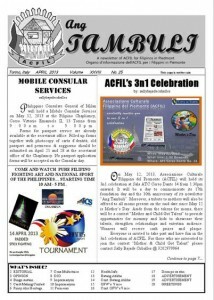 Get a copy of the March 2013 issue of Ang Tambuli from this link ACFIL’s-Ang-Tambuli-March-2013-Newsletter. Yes! we made it again. 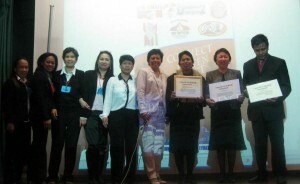 The combined efforts of ACFIL and Pinoywise brought success to another Finlit seminar last 24th February 2013 at Via Morgari 14. We would like to thank our attendees who came on time in spite of the bad weather. The one day seminar includes the financial planning and possible investment for OFW’s and their families as well as helping OFWs in addressing barriers to reintegration. After the seminar 3 attendees decided to start saving for their future by making their initial investment to SIDC cooperative. The collaboration and complete attendance of the FCs in the spirit of ―kapit-Bisig‖ was not in vain because the participants responded positively to the challenge. So friends out there don‘t miss the next seminar that you may become part of this worldwide struggle to make migration bring positive impact to the lives of many Filipinos!!! 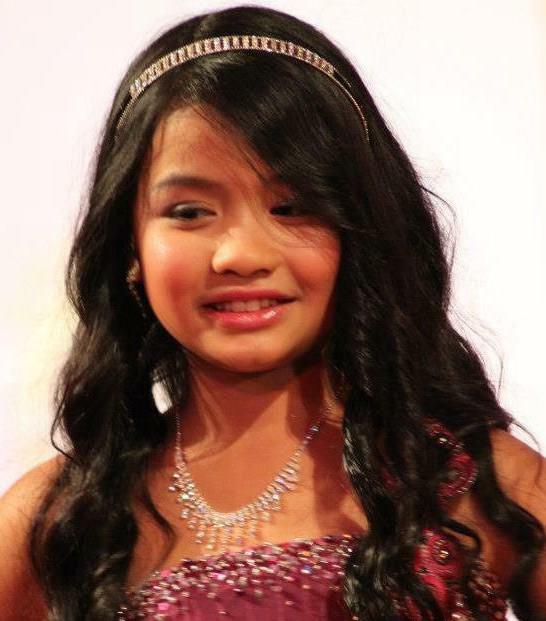 Little Miss Acfil 2012, Criestelle Ann Mortera will be the contender of the association for Filipino Chaplaincy‘s Search for Little Reyna Elena 2013 this coming 19th of May at San Luigi theater, Corso Vittorio Emanuele II, 13 Torino. She will compete with other contestants in the popularity contest for the title and other categories for the minor awards like Best in Long Gown, Best in 60‘s Attire, Best in Talent, Miss Photogenic, Miss Friendship and Miss Charity. Let‘s support our candidate. 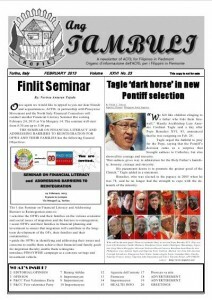 Get a copy of the February 2013 issue of Ang Tambuli from this link ACFIL’s-Ang-Tambuli-February-2013-Newsletter. 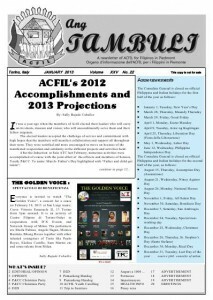 Get a copy of the January 2013 issue of Ang Tambuli from this link ACFIL’s-Ang-Tambuli-January-2013-Newsletter. 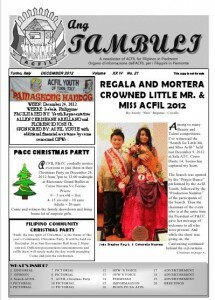 Get a copy of the December 2012 issue of Ang Tambuli from this link ACFIL’s-Ang-Tambuli-December-2012-Newsletter. 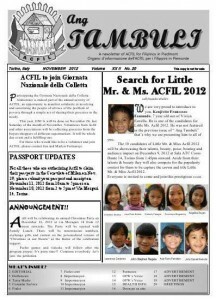 Get a copy of the November 2012 issue of Ang Tambuli from this link ACFIL-s-Ang-Tambuli-November-2012-Newsletter. 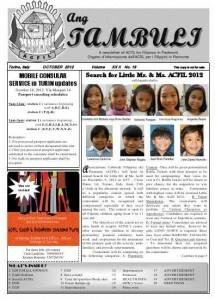 Get a copy of the October 2012 issue of Ang Tambuli from this link ACFIL-s-Ang-Tambuli-October-2012-Newsletter. Ang Tambuli – is the official Newsletter of ACFIL, started last 2002 up to the present to form and inform the Filipinos in the region regarding the political, social & migration issues especially to those who have the difficulty in comprehending the Italian language. This was financed by the Provincia di Torino for two years and the last 6 years, ACFIL continued the action independently due to the strong demand of the community taking out also the logo of the Provincia di Torino. 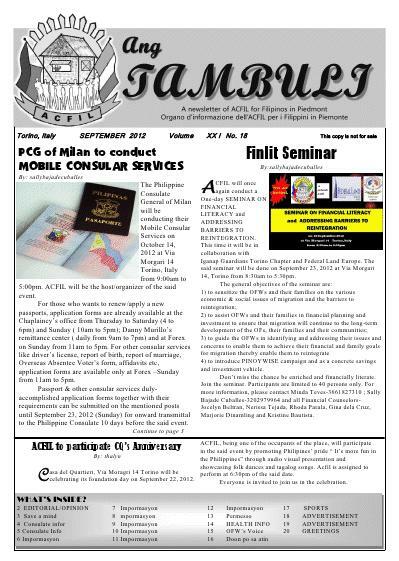 Get a copy of the September 2012 issue of Ang Tambuli from this link ACFIL-s-Ang-Tambuli-July-2012-Newsletter.